In centuries past, many a host had come down from the Prince's Pass with banners streaming, only to wither and broil on the hot red Dornish sands. "The arms of House Martell display the sun and spear, the Dornishman's two favored weapons," the Young Dragon had once written in his boastful Conquest of Dorne, "but of the two, the sun is the more deadly." 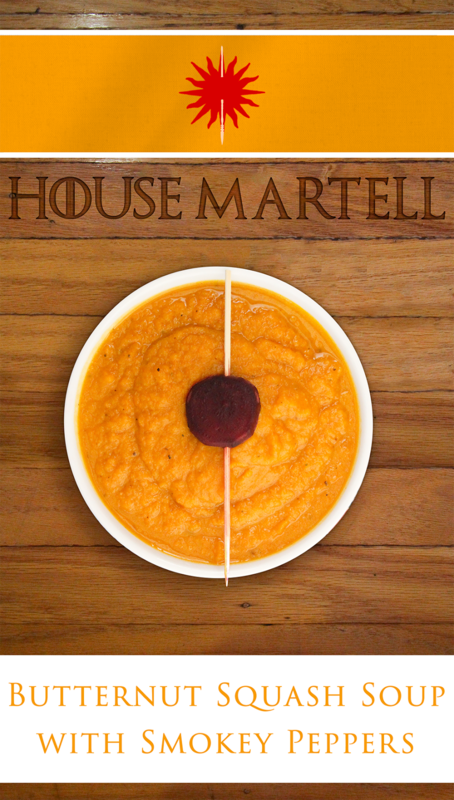 This roasted root soup served as the second course in my Season 7 Game of Thrones party. For this event, each course was inspired by the banners of one of the Great Houses of Westeros. While many of the Great Houses chose commonly eaten animals as their heraldry, the Martells did not. 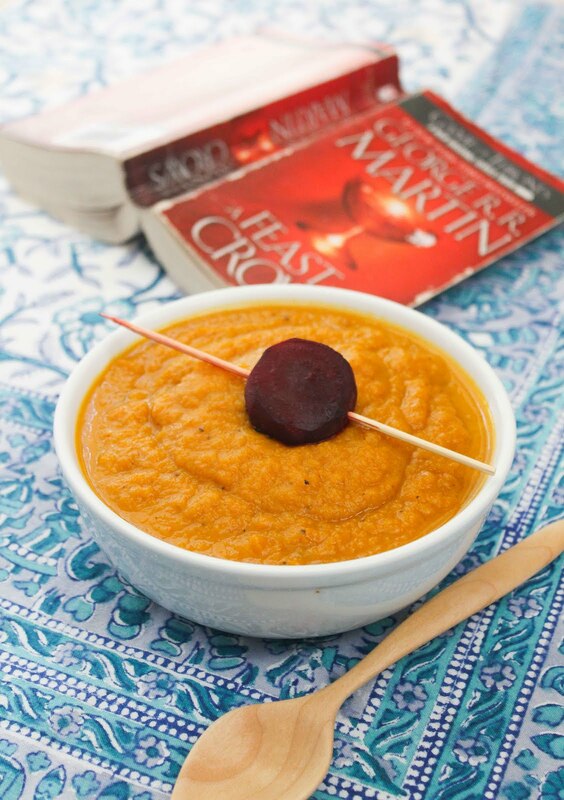 Early on in my menu development, I recognized I would either need to reject the nutritional needs of my dinner guests, or make the Martell course a vegetable course. (Westerosi lords ought to follow the lead of the Onion Knight and pick a vegetable for their banners!) The Tyrell green and gold seemed like a natural fit for the salad course, so the Martells became a soup course. I selected butternut squash for its appropriately orangey-yellow hue. I stirred in some chipotle peppers as a nod to the deadly hot sun and the fiery nature of the Dornish people. I tried a few different red garnishes, including sun dried tomatoes and pickled beets, eventually selecting roasted beets for their more sun-like appearance. Skewers both provide a convenient way of perching the beet "suns" over the soup while also representing the spears shown on the house banner. Roasting the squash before blending it into the soup adds a wonderful complex sweetness which pairs amazingly with the smokiness of the peppers. I think this course ended up being one of the favorites of the night! Peel the beets and cut them into half-inch slices. You should have at least one slice per guest, saving the less picturesque rounded ends for snacking while cooking. Toss the beet slices with 1 tbsp of the olive oil and a pinch of salt. Lay the beets on the lined baking sheet, keeping the pieces well-spaced. Roast the beet slices for 15-20 minutes, or until softened and browned. Allow them to cool, then thread each slice onto a skewer. Meanwhile, peel the butternut squash with a vegetable peeler. Scoop out the seeds and thready bits with a spoon. Chop into 1-inch cubes. Toss with the remaining 2 tbsp olive oil. Line two large baking sheets with parchment paper. Spread the squash pieces out over the baking sheets. Roast for 40 minutes, turning the pieces over halfway through the cooking time. When the squash is well-browned and cooked through, remove from the oven and allow to cool slightly. Meanwhile, heat the butter in a skillet over medium heat. Sauté the onion and carrot until the onions are golden and the carrots are softened. Stir in the garlic and black pepper and continue to cook for 2 minutes. 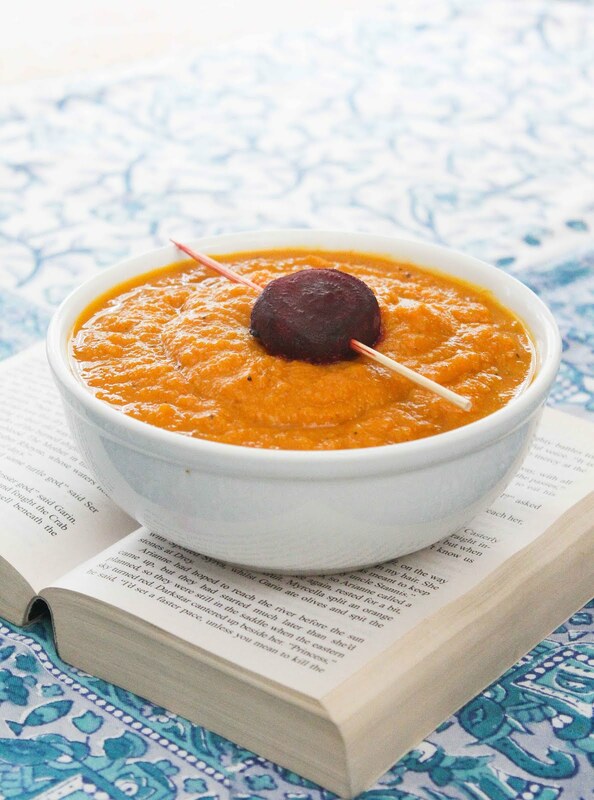 Transfer the carrots and onions to a blender along with 2 cups of the vegetable broth, the soy sauce, the chipotle peppers and the adobo sauce. Blend until smooth, then transfer to a large stock pot. Next, blend the roasted butternut squash with the remaining vegetable stock and add to the stock pot. Taste for seasoning, adding salt if necessary. Reheat the soup. Ladle into bowls and lay a beet skewer on top as garnish.